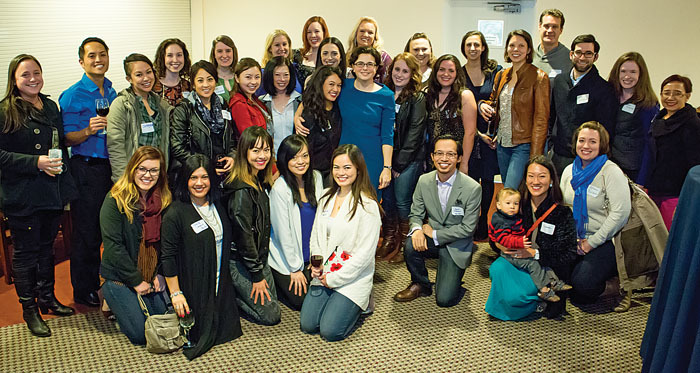 Dance alumni came to a January 2014 reception before the 20-year anniversary concert, where they saw numbers reprised from the days when they performed their pieces in Wiegand Theatre. Those who did not spend the majority of their high school years in the underground catacombs of SI Fine Arts might assume that SI did not dance until it went coed. Those who preferred the spotlight over daylight, however, might remember that SI students, like the fog, have danced on cat feet for decades. SI hired its first choreographer, John Ellis, to join the farmers and the cowhands in friendship in the 1966 production of Oklahoma! From 1966 through the ’70s, student and faculty choreographers took on the task of choreographing the musicals and musical revues. Marianne Schwarz made a significant imprint on SI dance by choreographing musicals and Musical Theatre Workshops during the late ’70s and early ’80s including My Fair Lady, Carnival and Hello, Dolly! Around this time, Schwarz was also the first choreographer hired to teach a formal dance class after school for the young men of SI. Ted Curry ’82 returned to SI in 1983 to choreograph 110 in the Shade, Cabaret, Mack and Mabel and several musical theatre revues. Curry was also the first to choreograph SI students as dancers in the Ignatian Guild Fashion Show in 1984, a tradition that continued for many years. From the January 2014 Dance Concert. Musical Theatre Workshop performances began to include dance numbers that stood apart from the musical scenes. The first year, dancers performed sections from A Chorus Line and Cats. (This would not be the last time Wildcats would perform in ears and tails!) Michelle Stubbs began choreographing musicals and fashion shows in 1987 and took SI dancers into the coeducational transition. Stubbs began the tradition of Saturday morning dance classes, and for years SI’s advanced dancers showed their dedication by rising early to practice on weekends as well as after school. In 1990, Julie Ferrari was hired after students lobbied for a dance class. When Ferrari (who also taught religious studies) joined the faculty, students finally had the opportunity to take dance classes during the school day. Beginning-level students were able to take classes to complete the Fine Arts portion of their graduation requirement, and Ferrari continued to teach more advanced classes on Saturdays. At this time, classes were held in Bannan Theatre or on the then-carpeted floor of the Band Room. Neither was an ideal space for dancers, so when construction began in the early 1990s, plans included the spacious Wiegand Theatre with its sprung floor and mirrors for the dancers. Wiegand Theatre opened in late 1993, but a swimming pool mishap soon flooded it, warping its floor. The room reopened in 1994, and finally, SI’s dancers had their own home. That year also brought another milestone in SI dance when Ferrari and her dance classes presented a concert titled Baseball, Broadway, and the Blues Brothers as the first dance performance that did not include dramatic acts as well. Erik DeLong ’97 was a freshman dancer in the show and recalls being one of four or five boys in the class and performing numbers from Damn Yankees and 42nd Street. Angela Brizuela (Delphino) joined the faculty as SI’s first full time dance teacher in the fall of 1994 and continued to develop the tradition of the annual dance concert with elaborate musical numbers and costumes. In both 1995 and 1999, SI dancers would again prowl and pounce to the music of Cats. Veronica Esmero ’03 recalls performing that Cats piece in front of the entire student body in the Fine Arts Assembly her freshman year wearing her “most embarrassing costume,” including fur, ears and tail. Brizuela expanded the dance program to include two levels of dance classes during the school day and added an additional class after school. More and more SI students were getting the opportunity to dance. Meredith Cecchin Galvin ’97 joined the faculty in 2001 and continued the expansion of SI dance. By 2003, the program offered two levels of dance to students during the school day and up to four levels after school and on weekends. SI Dance alumni Ted Curry and Lizette Ortega Dolan ’94 both returned to their dance roots upon joining the faculty at SI. Today, more than 100 students of varying levels participate annually in one or both of two annual dance concerts. The dance program continued its feline tradition in 2005 with the January concert wildCATS, which featured pieces from Broadway musicals including, predictably, Cats, choreographed by Dolan. In 2008, Galvin and Curry began hiring guest dancers and choreographers from the area to work with SI dancers on specialty pieces. Students had the chance to work intensely on a new style of dance and gain experience working with a professional in the field of dance. Since then students have worked in modern, contemporary, Bollywood, tap, ballet, hip hop, and more. In 2011, Katie Peterson joined the Dance Workshop team, teaching and choreographing various levels and styles. Our dancers would be little to look at onstage without the work of our technical crew and designers. For decades, Kevin Quattrin ’78 (see story on this page) has been the resident lighting designer for the Dance Concert. Former technical director Tom Galvin and Quattrin designed hundreds of pieces and trained countless students as stage managers, board operators and lighting designers. Some of those technicians have gone on to careers in technical theatre and one, SI math teacher Katie O’Reilly ’05, has returned to teach and design lighting. For the dancers, the costumes are often a tangible memory of a dance. SI dancers have been clothed over the years by Nelia Schubert, Marie Brizuela, Sara Ritchey and many student costume assistants helping to quickly change, repair and pin on those cat tails. 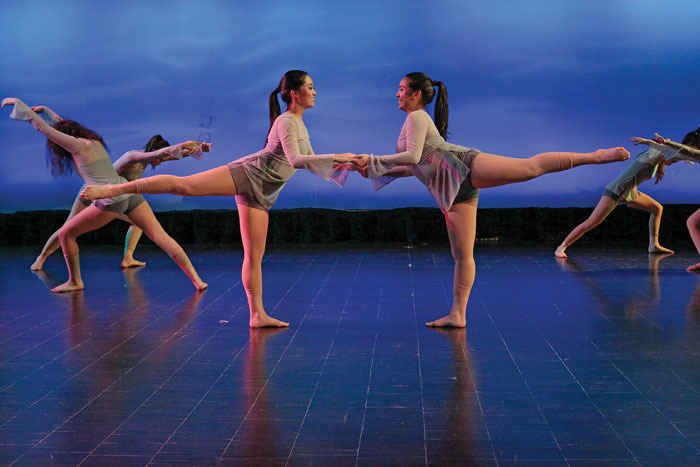 Though some musical choices might remain the same, SI’s dance program has advanced and grown since that first choreographer was hired 40 years ago. Jesuit schools have always held the performing arts in high regard as important for student development. It is such thinking by administrators, faculty, parents and students that allows our dance program to continue to expand and excel.